The theme for my weekly blog post eluded me last week. All week in fact, for I have been remiss, and did not post to my self-imposed schedule. Other matters have been on my mind and it seemed an indulgence I could ill-afford, this searching through my thoughts and half-formed ideas in the hope that inspiration may follow and a theme emerge, like the phoenix, arising from the ashes of its old self. 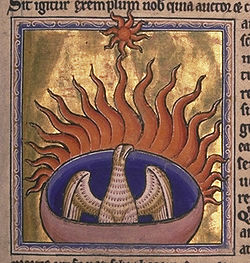 Distracting myself the while I rather got caught up in researching the myth of the phoenix, that bright and colourful bird with a life-cylce of some 500 – 1000 years. Near the end of its life it builds itself a nest of twigs, which then ignites. Both the bird and nest burn fiercely and are reduced to ashes, from which a new young phoenix arises, reborn anew. The new phoenix is destined to live as long as its old self. Back to my search for a theme. I have been invited to speak at the Westminster Education Forum, Wednesday 29th February, at Sixty One Whitehall, which seems to me the most impressive of addresses, on Reviewing the English Curriculum. At the time of the request to speak, back in September I believe, I was surprised at the conference theme, given that generally, events I am asked to speak at have SEN as a fairly central theme – Next Steps for SEN post the SEN Green Paper and the like. But then as I began to ponder and consider the agenda I revised my initial thoughts. I forget sometimes, the early days of my career in education and my first post as an English teacher. I taught at a large secondary school in Staffordshire, Walton County High School – http://www.waltonstaffs.com/ and subsequently, at a primary school and then day and residential special school for children and young people with a range of learning and behavioural needs, before moving wholly into special educational needs. I had forgotten also, the origins of my work which focused on literacy skills and skill deficits of young people. It is the tragedy of our great and proud country that we have such poor rates of literacy and numeracy in our young population, specifically those making the transition to secondary school. I say all that because, sometimes we can forget where our passions lie, what motivates us, what has driven our behaviour and actions in the past, that has led us to our present, to our current reality. Caught up in the relentless need to seek and earn new contracts and commissions, of moving between sectors and disciplines, writing and revising training programmes, somewhere alone the line I had forgotten my roots, forgotten what led me into education in the first place. The Westminster Forum’s request to speak on the revised English Curriculum is a timely reminder of all that is important to me, and of all that has influenced my thinking and educational beliefs and philosophy. I find myself becoming excited by its potential, excited by the opportunity to speak once more and decide and refine what it is that matters most to me to say. What will be the impact of library closures on literacy levels and encouraging young people to become lifelong readers? Far removed from the world of fame and celebrity, my own childhood was made inifinitely richer, more varied and wondrous by the arrival, every Tuesday afternoon, of the village library bus. When I had exhausted the meagre supply of children’s books (back to the ’70s again, long before young adult fiction was the norm), I made my way through the adult reading collection, which comprised 95% of the library’s stock. My choices caused the Headteacher at primary school more than once, to check my progress and understanding of the books I carried proudly with me to school, as I was called to read out loud at his desk. My mother held onto a photograph taken at a guess I would say in 1973, and published in a local paper. I do not know why the photo was taken or by whom. Perhaps it was one of a series for the annual tidy village competition. Aside all that, there are two women chatting on the steps of a cottage, which quite incidentally is the cottage where my father was born. Look more closely, to the right of the picture, and you will see a young girl walking head down, engrossed in the book in her hands. That young girl is me. My own love of libraries has endured, although my inclination to gather up library fines has supported the purchase of many a new title, I am sure. Whilst my taste in libraries has remained local, I am never more pleased than when time permits and I may indulge a love of larger city libraries, or exploring the libraries of others. 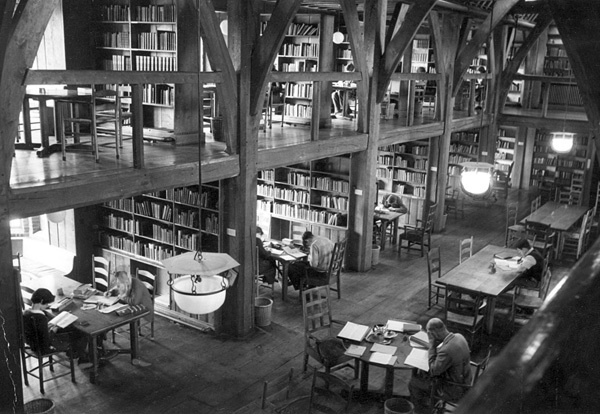 National Trust properties frequently have the most glorious private libraries that fill me with a great sense of delight, satisfaction and awe, so much that I am always loathe to move on and leave these fantastic and romantic worlds of possibility behind. Finally, I have encountered the most wondrous site, Beautiful Libraries, created by Beth, whose talents and knowledge of libraries is surely unrivalled. You can be lost many an hour perusing the virtual world of libraries, categorised according to every whim and taste – but do make sure you visit at least one! 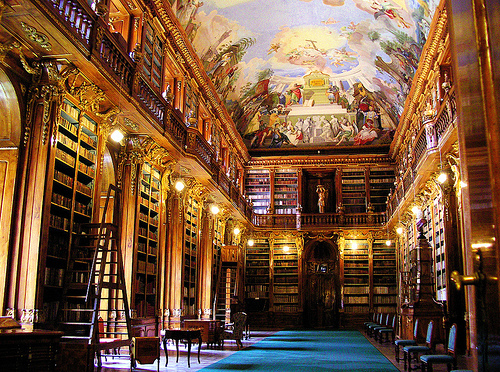 This most magnificent library in Prague is on my wish-list to visit.